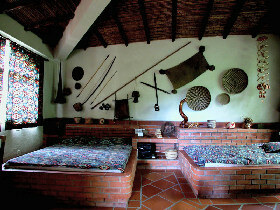 an inn or "posada" in Carabobo State in Venezuela, is truly a glimpse of paradise as seen by the live-in owners, Norbert and Gaby Flauger who have set it all up for anyone and everyone with an interest in nature, be they birdwatchers, insect, reptile or amphibian buffs, botanists or nature photographers. 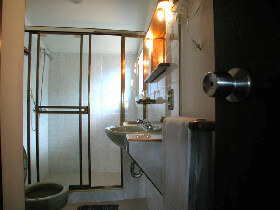 This is just the place for anybody who wants to feel right at home while taking a little time out from everyday life. In the garden alone at CASA MARIA, 140 different species of birds have been logged whilst a further 160 have been seen in the surrounding area. By clicking here, you can access a list of them all. 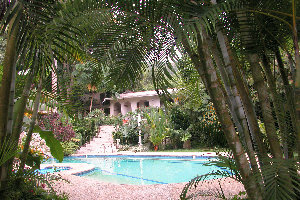 While you're at CASA MARIA, each day will bring a whole concerto of insect sounds, enhanced at eventide with additional calls from frogs galore, resident in the posada's various ponds. 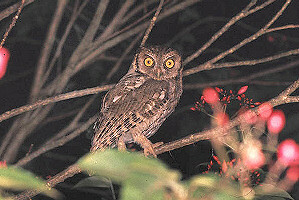 For birdwatchers: Please click here for a bird list an additional pictures. 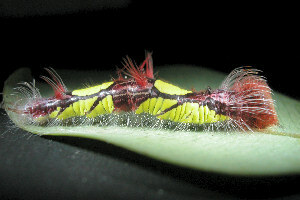 For entomologists: Please click here for special pictures. 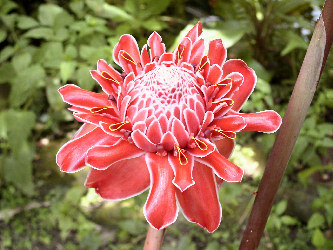 For botanists: Please click here to see the plants of Casa Maria. 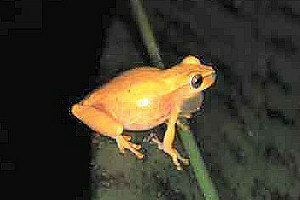 For herpetologists: Please click here to see special pictures. A National Geographic film-team at work at Casa Maria. 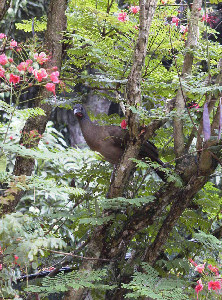 Can you spot the Chacalaca? 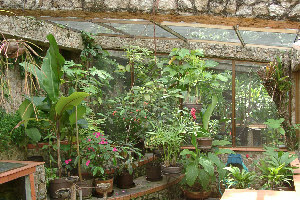 There are two butterfly houses and several small terrariums, backed by a very respectable nursery garden that functions in support of the serious research on the local the butterfly and beetle population carried out at CASA MARIA. 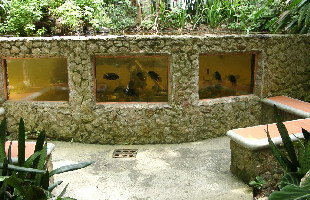 There are several aquariums up to 30,000 litres in size that, besides providing restful contemplation, also give some idea of the fauna in Venezuelan and Caribbean rivers. In the 5-acre garden, home to over 200 species of plants, there is also a swimming pool and a jacuzzi. 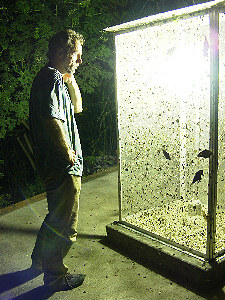 Open air aquarium in the garden. There are six thoughtfully arranged bedrooms, including two in adjoining bungalows, all with ensuite bathrooms and hot/cold water. 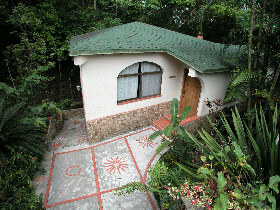 The house is located in the Venezuelan coastal mountain range, the "cordillera de la costa", at some 760 metres, being about 2,500 feet, above sea level; it is about three hours by car from the capital, Caracas, and about 1 hour by car from the Caribbean itself. The climate can be compared to that of central Europe in summertime: neither too hot nor too cold and, whilst possibly a little damper, out-and-out rainy days rare. 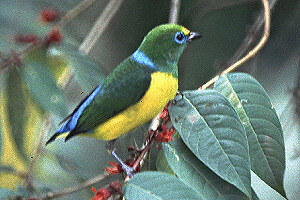 There are myriad possibilities for local exploratory trips, including an intact patch of rain forest at some 940 metres, being about 3,100 feet, quite close by above the house. 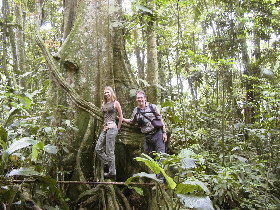 Both Gaby and Norbert, himself a trained engineer and biologist, can accompany guests on excursions in the area and even further afield. Click here for a map, showing the CASA MARIA location. If you have Google Earth installed, you can click HERE to get the "kmz-file" and then you can "fly" virtually to CASA MARIA. If not, you will need to install Google Earth first (available at http://earth.google.com). 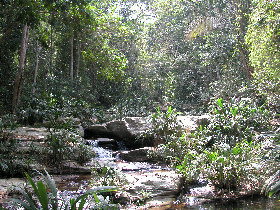 A small jungle river near Casa Maria. 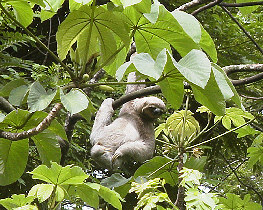 Frequently you can observe sloths in our garden. 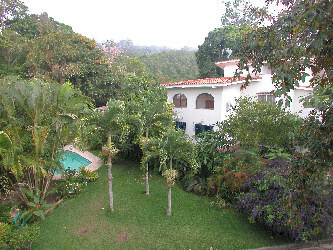 In the house itself, CASA MARIA keeps a library with a broad choice of books for guests' enjoyment and, offers a scientifically narrated 3-D slide show of flora and fauna that is truly unique. 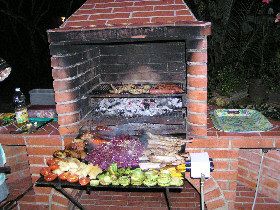 If you click HERE , you are able to enjoy some panorama-pictures of CASA MARIA. To view these pictures, the QuickTime plug-in must be installed on your computer. For those guests who like to keep up with the world at large, there is a satellite TV system offering CNN, Deutsche Welle and numerous other international TV options. The above is a quick overview of what Casa Maria can offer: and all that in three languages: English, Spanish and German. You learn more about us, clicking the above menu.